Heat the oil in a large non-stick frying pan over high heat. Add the sausage meat and cook for 6 minutes, breaking up any lumps with the back of a spoon. Place in a large bowl. Wipe the pan clean with paper towel and set aside. 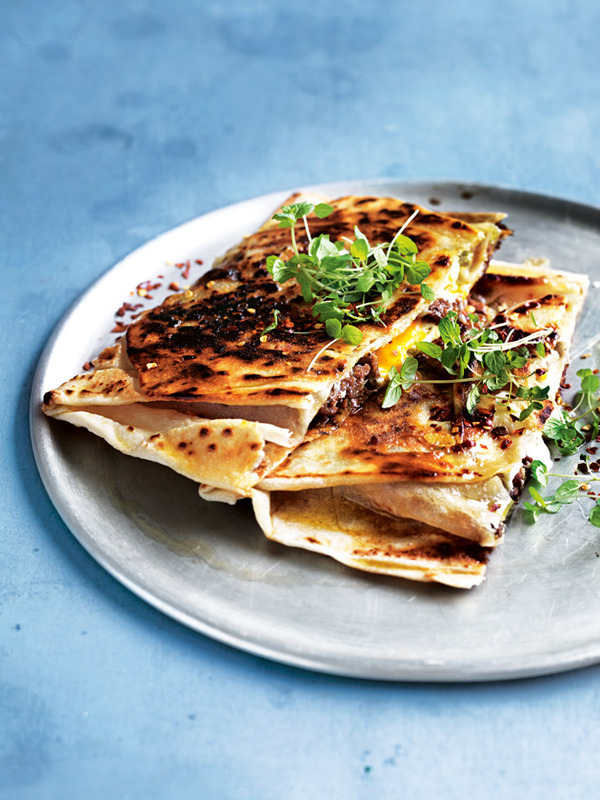 Divide the lamb and olive between each flatbread, leaving a 10cm border. Make a well in the centre of each, crack an egg into the well, top with the provolone and fold over the edges to enclose the filling. Lightly grease the pan and place over high heat. Cook 1 gozleme for 3 minutes each side or until golden, the cheese is melted and the egg is just cooked. Repeat with the remaining gozleme. Cut each in half and top with the mint and chilli to serve. Serves 4. + You can use any flatbread you like – we used store-bought roti. If using roti, unfold the flatbread.